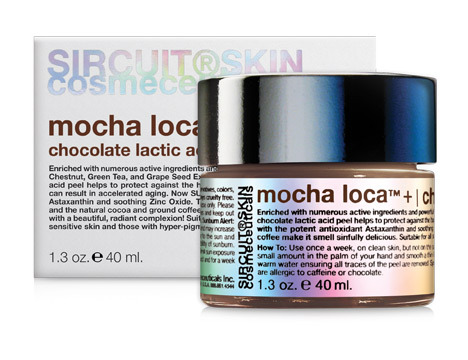 Mocha Loca™+ is a potent, Chirally Correct, L-Lactic Acid peel enriched with numerous active ingredients and powerful antioxidants that help to shield against the harmful effects of free radical damage that can result in accelerated aging. SUPERCHARGED with potent ingredients that help to soothe and protect, this emollient formula softens comedones while the natural cocoa and ground coffee make it smell sinfully delicious leaving you with a beautiful, radiant complexion! Bestseller! Sinfully sweet, no calorie, carb-free chocolate fix! 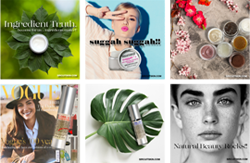 Skin Type: Suitable for all skin types, especially dry and/or sensitive skin and those with hyper-pigmentation. Cocoa: A powerful antioxidant with excellent skin-firming properties. Hazelnut Oil (aka Hazel Seed Oil): Known for its emollient benefits which help to improve the skin’s ability to retain moisture, thus enhancing the skin’s level of hydration and overall appearance. Borago Officinalis Seed Oil: Borage Oil contains a high concentration of GLA (Gamma Linolenic Acid) that helps to improve moisture retention at the skin’s surface encouraging dry skin to feel soft and smooth. Formulated With: Aqua (Water), Glycerin, Theobroma Cacao (Cocoa) Fruit Powder, Albumen, Lactic Acid (L), Caprylic/Capric Triglyceride, Polyglyceryl-4 Caprate, Cetyl Alcohol, Stearic Acid, Coffea Arabica (Coffee) Seed Powder, Vitis Vinifera (Grape) Seed Extract, Squalane, Glyceryl Stearate, Lactobacillus/Cocoa Fruit Ferment Filtrate, Corylus Avellana (Hazel) Seed Oil, Borago Officinalis (Borage) Seed Oil*, Zinc Oxide, Caffeine, Astaxanthin, Aesculus Hippocastanum (Horse Chestnut) Bark Extract, Camellia Sinensis (Green Tea) Leaf Extract, Passiflora Incarnata (Passionflower) Flower Extract, Tocopheryl Acetate (D-alpha), Limnanthes Alba (Meadowfoam) Seed Oil, Helianthus Annuus (Sunflower) Seed Oil, Allantoin, Lonicera Caprifolium (Honeysuckle) Flower Extract, Lonicera Japonica (Honeysuckle) Flower Extract, Gluconolactone, Hamamelis Virginiana (Witch Hazel) Water, Alcohol Denat, Xanthan Gum, Polysorbate 20, Sodium Benzoate, Potassium Sorbate, Fragrance/Parfum+ (Natural). *USDA Certified Organic | NOP. Phthalate-free. Sunburn Alert: This product is a peel and may increase your skin’s sensitivity to the sun. Use Sol-Avert™ SPF 30 daily and limit sun exposure for one week following this treatment. Special Note: Although this product is suitable for all skin types, it should not be used on people that are allergic to caffeine or chocolate.